For other uses, see Transistor (disambiguation). A transistor is a semiconductor device used to amplify or switch electronic signals and electrical power. It is composed of semiconductor material usually with at least three terminals for connection to an external circuit. A voltage or current applied to one pair of the transistor's terminals controls the current through another pair of terminals. Because the controlled (output) power can be higher than the controlling (input) power, a transistor can amplify a signal. Today, some transistors are packaged individually, but many more are found embedded in integrated circuits. The transistor is the fundamental building block of modern electronic devices, and is ubiquitous in modern electronic systems. Julius Edgar Lilienfeld patented a field-effect transistor in 1926 but it was not possible to actually construct a working device at that time. The first practically implemented device was a point-contact transistor invented in 1947 by American physicists John Bardeen, Walter Brattain, and William Shockley. The transistor revolutionized the field of electronics, and paved the way for smaller and cheaper radios, calculators, and computers, among other things. 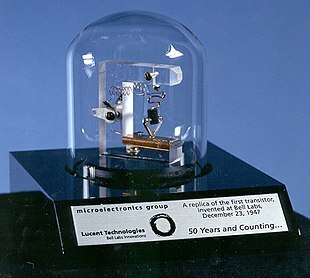 The transistor is on the list of IEEE milestones in electronics, and Bardeen, Brattain, and Shockley shared the 1956 Nobel Prize in Physics for their achievement. Most transistors are made from very pure silicon or germanium, but certain other semiconductor materials can also be used. A transistor may have only one kind of charge carrier, in a field effect transistor, or may have two kinds of charge carriers in bipolar junction transistor devices. Compared with the vacuum tube, transistors are generally smaller, and require less power to operate. Certain vacuum tubes have advantages over transistors at very high operating frequencies or high operating voltages. Many types of transistors are made to standardized specifications by multiple manufacturers. The thermionic triode, a vacuum tube invented in 1907, enabled amplified radio technology and long-distance telephony. The triode, however, was a fragile device that consumed a substantial amount of power. In 1909 physicist William Eccles discovered the crystal diode oscillator. Physicist Julius Edgar Lilienfeld filed a patent for a field-effect transistor (FET) in Canada in 1925 , which was intended to be a solid-state replacement for the triode. Lilienfeld also filed identical patents in the United States in 1926 and 1928. However, Lilienfeld did not publish any research articles about his devices nor did his patents cite any specific examples of a working prototype. Because the production of high-quality semiconductor materials was still decades away, Lilienfeld's solid-state amplifier ideas would not have found practical use in the 1920s and 1930s, even if such a device had been built. In 1934, German inventor Oskar Heil patented a similar device in Europe. From November 17, 1947, to December 23, 1947, John Bardeen and Walter Brattain at AT&T's Bell Labs in Murray Hill, New Jersey of the United States performed experiments and observed that when two gold point contacts were applied to a crystal of germanium, a signal was produced with the output power greater than the input. Solid State Physics Group leader William Shockley saw the potential in this, and over the next few months worked to greatly expand the knowledge of semiconductors. The term transistor was coined by John R. Pierce as a contraction of the term transresistance. According to Lillian Hoddeson and Vicki Daitch, authors of a biography of John Bardeen, Shockley had proposed that Bell Labs' first patent for a transistor should be based on the field-effect and that he be named as the inventor. Having unearthed Lilienfeld’s patents that went into obscurity years earlier, lawyers at Bell Labs advised against Shockley's proposal because the idea of a field-effect transistor that used an electric field as a "grid" was not new. Instead, what Bardeen, Brattain, and Shockley invented in 1947 was the first point-contact transistor. In acknowledgement of this accomplishment, Shockley, Bardeen, and Brattain were jointly awarded the 1956 Nobel Prize in Physics "for their researches on semiconductors and their discovery of the transistor effect". In 1948, the point-contact transistor was independently invented by German physicists Herbert Mataré and Heinrich Welker while working at the Compagnie des Freins et Signaux, a Westinghouse subsidiary located in Paris. Mataré had previous experience in developing crystal rectifiers from silicon and germanium in the German radar effort during World War II. Using this knowledge, he began researching the phenomenon of "interference" in 1947. By June 1948, witnessing currents flowing through point-contacts, Mataré produced consistent results using samples of germanium produced by Welker, similar to what Bardeen and Brattain had accomplished earlier in December 1947. Realizing that Bell Labs' scientists had already invented the transistor before them, the company rushed to get its "transistron" into production for amplified use in France's telephone network. The first bipolar junction transistors were invented by Bell Labs' William Shockley, which applied for patent (2,569,347) on June 26, 1948. On April 12, 1950, Bell Labs chemists Gordon Teal and Morgan Sparks had successfully produced a working bipolar NPN junction amplifying germanium transistor. Bell Labs had announced the discovery of this new "sandwich" transistor in a press release on July 4, 1951. The first high-frequency transistor was the surface-barrier germanium transistor developed by Philco in 1953, capable of operating up to 60 MHz. These were made by etching depressions into an N-type germanium base from both sides with jets of Indium(III) sulfate until it was a few ten-thousandths of an inch thick. Indium electroplated into the depressions formed the collector and emitter. The first "prototype" pocket transistor radio was shown by INTERMETALL (a company founded by Herbert Mataré in 1952) at the Internationale Funkausstellung Düsseldorf between August 29, 1953 and September 9, 1953. The first "production" pocket transistor radio was the Regency TR-1, released in October 1954. Produced as a joint venture between the Regency Division of Industrial Development Engineering Associates, I.D.E.A. and Texas Instruments of Dallas Texas, the TR-1 was manufactured in Indianapolis, Indiana. It was a near pocket-sized radio featuring 4 transistors and one germanium diode. The industrial design was outsourced to the Chicago firm of Painter, Teague and Petertil. It was initially released in one of four different colours: black, bone white, red, and gray. Other colours were to shortly follow. The first "production" all-transistor car radio was developed by Chrysler and Philco corporations and it was announced in the April 28th 1955 edition of the Wall Street Journal. Chrysler had made the all-transistor car radio, Mopar model 914HR, available as an option starting in fall 1955 for its new line of 1956 Chrysler and Imperial cars which first hit the dealership showroom floors on October 21, 1955. The first working silicon transistor was developed at Bell Labs on January 26, 1954 by Morris Tanenbaum. The first commercial silicon transistor was produced by Texas Instruments in 1954. This was the work of Gordon Teal, an expert in growing crystals of high purity, who had previously worked at Bell Labs. The first MOSFET actually built was by Kahng and Atalla at Bell Labs in 1960. A Darlington transistor opened up so the actual transistor chip (the small square) can be seen inside. A Darlington transistor is effectively two transistors on the same chip. One transistor is much larger than the other, but both are large in comparison to transistors in large-scale integration because this particular example is intended for power applications. The transistor is the key active component in practically all modern electronics. Many consider it to be one of the greatest inventions of the 20th century. Its importance in today's society rests on its ability to be mass-produced using a highly automated process (semiconductor device fabrication) that achieves astonishingly low per-transistor costs. The invention of the first transistor at Bell Labs was named an IEEE Milestone in 2009. Although several companies each produce over a billion individually packaged (known as discrete) transistors every year, the vast majority of transistors are now produced in integrated circuits (often shortened to IC, microchips or simply chips), along with diodes, resistors, capacitors and other electronic components, to produce complete electronic circuits. A logic gate consists of up to about twenty transistors whereas an advanced microprocessor, as of 2009, can use as many as 3 billion transistors (MOSFETs). "About 60 million transistors were built in 2002… for [each] man, woman, and child on Earth." The transistor's low cost, flexibility, and reliability have made it a ubiquitous device. Transistorized mechatronic circuits have replaced electromechanical devices in controlling appliances and machinery. It is often easier and cheaper to use a standard microcontroller and write a computer program to carry out a control function than to design an equivalent mechanical system to control that same function. A simple circuit diagram to show the labels of a n–p–n bipolar transistor. The essential usefulness of a transistor comes from its ability to use a small signal applied between one pair of its terminals to control a much larger signal at another pair of terminals. This property is called gain. It can produce a stronger output signal, a voltage or current, which is proportional to a weaker input signal; that is, it can act as an amplifier. Alternatively, the transistor can be used to turn current on or off in a circuit as an electrically controlled switch, where the amount of current is determined by other circuit elements. There are two types of transistors, which have slight differences in how they are used in a circuit. A bipolar transistor has terminals labeled base, collector, and emitter. A small current at the base terminal (that is, flowing between the base and the emitter) can control or switch a much larger current between the collector and emitter terminals. For a field-effect transistor, the terminals are labeled gate, source, and drain, and a voltage at the gate can control a current between source and drain. The image represents a typical bipolar transistor in a circuit. Charge will flow between emitter and collector terminals depending on the current in the base. Because internally the base and emitter connections behave like a semiconductor diode, a voltage drop develops between base and emitter while the base current exists. The amount of this voltage depends on the material the transistor is made from, and is referred to as VBE. BJT used as an electronic switch, in grounded-emitter configuration. Transistors are commonly used in digital circuits as electronic switches which can be either in an "on" or "off" state, both for high-power applications such as switched-mode power supplies and for low-power applications such as logic gates. Important parameters for this application include the current switched, the voltage handled, and the switching speed, characterised by the rise and fall times. In a grounded-emitter transistor circuit, such as the light-switch circuit shown, as the base voltage rises, the emitter and collector currents rise exponentially. The collector voltage drops because of reduced resistance from collector to emitter. If the voltage difference between the collector and emitter were zero (or near zero), the collector current would be limited only by the load resistance (light bulb) and the supply voltage. This is called saturation because current is flowing from collector to emitter freely. When saturated, the switch is said to be on. Providing sufficient base drive current is a key problem in the use of bipolar transistors as switches. The transistor provides current gain, allowing a relatively large current in the collector to be switched by a much smaller current into the base terminal. The ratio of these currents varies depending on the type of transistor, and even for a particular type, varies depending on the collector current. In the example light-switch circuit shown, the resistor is chosen to provide enough base current to ensure the transistor will be saturated. In a switching circuit, the idea is to simulate, as near as possible, the ideal switch having the properties of open circuit when off, short circuit when on, and an instantaneous transition between the two states. Parameters are chosen such that the "off" output is limited to leakage currents too small to affect connected circuitry; the resistance of the transistor in the "on" state is too small to affect circuitry; and the transition between the two states is fast enough not to have a detrimental effect. Amplifier circuit, common-emitter configuration with a voltage-divider bias circuit. The common-emitter amplifier is designed so that a small change in voltage (Vin) changes the small current through the base of the transistor; the transistor's current amplification combined with the properties of the circuit means that small swings in Vin produce large changes in Vout. Various configurations of single transistor amplifier are possible, with some providing current gain, some voltage gain, and some both. From mobile phones to televisions, vast numbers of products include amplifiers for sound reproduction, radio transmission, and signal processing. The first discrete-transistor audio amplifiers barely supplied a few hundred milliwatts, but power and audio fidelity gradually increased as better transistors became available and amplifier architecture evolved. Modern transistor audio amplifiers of up to a few hundred watts are common and relatively inexpensive. Before transistors were developed, vacuum (electron) tubes (or in the UK "thermionic valves" or just "valves") were the main active components in electronic equipment. not susceptible to breakage of a glass envelope, leakage, outgassing, and other physical damage. vacuum tubes in audio applications create significant lower-harmonic distortion, the so-called tube sound, which some people prefer. amplification factor hFE, βF (transistor beta) or gm (transconductance). Hence, a particular transistor may be described as silicon, surface-mount, BJT, n–p–n, low-power, high-frequency switch. A popular way to remember which symbol represents which type of transistor is to look at the arrow and how it is arranged. Within an NPN transistor symbol, the arrow will Not Point iN. Conversely, within the PNP symbol you see that the arrow Points iN Proudly. Bipolar transistors are so named because they conduct by using both majority and minority carriers. The bipolar junction transistor, the first type of transistor to be mass-produced, is a combination of two junction diodes, and is formed of either a thin layer of p-type semiconductor sandwiched between two n-type semiconductors (an n–p–n transistor), or a thin layer of n-type semiconductor sandwiched between two p-type semiconductors (a p–n–p transistor). This construction produces two p–n junctions: a base–emitter junction and a base–collector junction, separated by a thin region of semiconductor known as the base region (two junction diodes wired together without sharing an intervening semiconducting region will not make a transistor). BJTs have three terminals, corresponding to the three layers of semiconductor—an emitter, a base, and a collector. They are useful in amplifiers because the currents at the emitter and collector are controllable by a relatively small base current. In an n–p–n transistor operating in the active region, the emitter–base junction is forward biased (electrons and holes recombine at the junction), and the base-collector junction is reverse biased (electrons and holes are formed at, and move away from the junction), and electrons are injected into the base region. Because the base is narrow, most of these electrons will diffuse into the reverse-biased base–collector junction and be swept into the collector; perhaps one-hundredth of the electrons will recombine in the base, which is the dominant mechanism in the base current. As well, as the base is lightly doped (in comparison to the emitter and collector regions), recombination rates are low, permitting more carriers to diffuse across the base region. By controlling the number of electrons that can leave the base, the number of electrons entering the collector can be controlled. Collector current is approximately β (common-emitter current gain) times the base current. It is typically greater than 100 for small-signal transistors but can be smaller in transistors designed for high-power applications. Unlike the field-effect transistor (see below), the BJT is a low-input-impedance device. Also, as the base–emitter voltage (VBE) is increased the base–emitter current and hence the collector–emitter current (ICE) increase exponentially according to the Shockley diode model and the Ebers-Moll model. Because of this exponential relationship, the BJT has a higher transconductance than the FET. Bipolar transistors can be made to conduct by exposure to light, because absorption of photons in the base region generates a photocurrent that acts as a base current; the collector current is approximately β times the photocurrent. Devices designed for this purpose have a transparent window in the package and are called phototransistors. Operation of a FET and its Id-Vg curve. At first, when no gate voltage is applied. There is no inversion electron in the channel, the device is OFF. As gate voltage increase, inversion electron density in the channel increase, current increase, the device turns on. The field-effect transistor, sometimes called a unipolar transistor, uses either electrons (in n-channel FET) or holes (in p-channel FET) for conduction. The four terminals of the FET are named source, gate, drain, and body (substrate). On most FETs, the body is connected to the source inside the package, and this will be assumed for the following description. In a FET, the drain-to-source current flows via a conducting channel that connects the source region to the drain region. The conductivity is varied by the electric field that is produced when a voltage is applied between the gate and source terminals; hence the current flowing between the drain and source is controlled by the voltage applied between the gate and source. As the gate–source voltage (VGS) is increased, the drain–source current (IDS) increases exponentially for VGS below threshold, and then at a roughly quadratic rate (IDS ∝ (VGS − VT)2) (where VT is the threshold voltage at which drain current begins) in the "space-charge-limited" region above threshold. A quadratic behavior is not observed in modern devices, for example, at the 65 nm technology node. For low noise at narrow bandwidth the higher input resistance of the FET is advantageous. FETs are divided into two families: junction FET (JFET) and insulated gate FET (IGFET). The IGFET is more commonly known as a metal–oxide–semiconductor FET (MOSFET), reflecting its original construction from layers of metal (the gate), oxide (the insulation), and semiconductor. Unlike IGFETs, the JFET gate forms a p–n diode with the channel which lies between the source and drain. Functionally, this makes the n-channel JFET the solid-state equivalent of the vacuum tube triode which, similarly, forms a diode between its grid and cathode. Also, both devices operate in the depletion mode, they both have a high input impedance, and they both conduct current under the control of an input voltage. Metal–semiconductor FETs (MESFETs) are JFETs in which the reverse biased p–n junction is replaced by a metal–semiconductor junction. These, and the HEMTs (high-electron-mobility transistors, or HFETs), in which a two-dimensional electron gas with very high carrier mobility is used for charge transport, are especially suitable for use at very high frequencies (microwave frequencies; several GHz). FETs are further divided into depletion-mode and enhancement-mode types, depending on whether the channel is turned on or off with zero gate-to-source voltage. For enhancement mode, the channel is off at zero bias, and a gate potential can "enhance" the conduction. For the depletion mode, the channel is on at zero bias, and a gate potential (of the opposite polarity) can "deplete" the channel, reducing conduction. For either mode, a more positive gate voltage corresponds to a higher current for n-channel devices and a lower current for p-channel devices. Nearly all JFETs are depletion-mode because the diode junctions would forward bias and conduct if they were enhancement-mode devices; most IGFETs are enhancement-mode types. 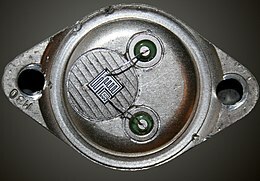 The bipolar junction transistor (BJT) was the most commonly used transistor in the 1960s and 70s. Even after MOSFETs became widely available, the BJT remained the transistor of choice for many analog circuits such as amplifiers because of their greater linearity and ease of manufacture. In integrated circuits, the desirable properties of MOSFETs allowed them to capture nearly all market share for digital circuits. Discrete MOSFETs can be applied in transistor applications, including analog circuits, voltage regulators, amplifiers, power transmitters and motor drivers. 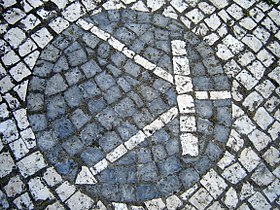 Transistor symbol created on Portuguese pavement in the University of Aveiro. For early bipolar transistors, see Bipolar junction transistor § Bipolar transistors. emitter-switched-bipolar-transistor (ESBT) is a monolithic configuration of a high voltage bipolar transistor and a low voltage power MOSFET in cascode topology. It was introduced by STMicroelectronics in the 2000s, and abandoned a few years later around 2012.
multiple-base transistor, used to amplify very-low-level signals in noisy environments such as the pickup of a record player or radio front ends. Effectively, it is a very large number of transistors in parallel where, at the output, the signal is added constructively, but random noise is added only stochastically. deoxyribonucleic acid field-effect transistor (DNAFET). Tunnel field-effect transistor, where it switches by modulating quantum tunnelling through a barrier. Diffusion transistor, formed by diffusing dopants into semiconductor substrate; can be both BJT and FET. Unijunction transistor, can be used as simple pulse generators. It comprise a main body of either P-type or N-type semiconductor with ohmic contacts at each end (terminals Base1 and Base2). A junction with the opposite semiconductor type is formed at a point along the length of the body for the third terminal (Emitter). Single-electron transistors (SET), consist of a gate island between two tunneling junctions. The tunneling current is controlled by a voltage applied to the gate through a capacitor. Nanofluidic transistor, controls the movement of ions through sub-microscopic, water-filled channels. dual-gate field-effect transistors have a single channel with two gates in cascode; a configuration optimized for high-frequency amplifiers, mixers, and oscillators. Junctionless nanowire transistor (JNT), uses a simple nanowire of silicon surrounded by an electrically isolated "wedding ring" that acts to gate the flow of electrons through the wire. Vacuum-channel transistor, when in 2012, NASA and the National Nanofab Center in South Korea were reported to have built a prototype vacuum-channel transistor in only 150 nanometers in size, can be manufactured cheaply using standard silicon semiconductor processing, can operate at high speeds even in hostile environments, and could consume just as much power as a standard transistor. A Solaristor (from solar cell transistor) is a two-terminal gate-less self-powered phototransistor. The types of some transistors can be parsed from the part number. There are three major semiconductor naming standards; in each the alphanumeric prefix provides clues to type of the device. The JIS-C-7012 specification for transistor part numbers starts with "2S", e.g. 2SD965, but sometimes the "2S" prefix is not marked on the package – a 2SD965 might only be marked "D965"; a 2SC1815 might be listed by a supplier as simply "C1815". This series sometimes has suffixes (such as "R", "O", "BL", standing for "red", "orange", "blue", etc.) to denote variants, such as tighter hFE (gain) groupings. The JEDEC EIA370 transistor device numbers usually start with "2N", indicating a three-terminal device (dual-gate field-effect transistors are four-terminal devices, so begin with 3N), then a 2, 3 or 4-digit sequential number with no significance as to device properties (although early devices with low numbers tend to be germanium). For example, 2N3055 is a silicon n–p–n power transistor, 2N1301 is a p–n–p germanium switching transistor. A letter suffix (such as "A") is sometimes used to indicate a newer variant, but rarely gain groupings. Manufacturers of devices may have their own proprietary numbering system, for example CK722. Since devices are second-sourced, a manufacturer's prefix (like "MPF" in MPF102, which originally would denote a Motorola FET) now is an unreliable indicator of who made the device. Some proprietary naming schemes adopt parts of other naming schemes, for example a PN2222A is a (possibly Fairchild Semiconductor) 2N2222A in a plastic case (but a PN108 is a plastic version of a BC108, not a 2N108, while the PN100 is unrelated to other xx100 devices). Military part numbers sometimes are assigned their own codes, such as the British Military CV Naming System. With so many independent naming schemes, and the abbreviation of part numbers when printed on the devices, ambiguity sometimes occurs. For example, two different devices may be marked "J176" (one the J176 low-power JFET, the other the higher-powered MOSFET 2SJ176). As older "through-hole" transistors are given surface-mount packaged counterparts, they tend to be assigned many different part numbers because manufacturers have their own systems to cope with the variety in pinout arrangements and options for dual or matched n–p–n + p–n–p devices in one pack. So even when the original device (such as a 2N3904) may have been assigned by a standards authority, and well known by engineers over the years, the new versions are far from standardized in their naming. The first BJTs were made from germanium (Ge). Silicon (Si) types currently predominate but certain advanced microwave and high-performance versions now employ the compound semiconductor material gallium arsenide (GaAs) and the semiconductor alloy silicon germanium (SiGe). Single element semiconductor material (Ge and Si) is described as elemental. Rough parameters for the most common semiconductor materials used to make transistors are given in the adjacent table; these parameters will vary with increase in temperature, electric field, impurity level, strain, and sundry other factors. The junction forward voltage is the voltage applied to the emitter–base junction of a BJT in order to make the base conduct a specified current. The current increases exponentially as the junction forward voltage is increased. The values given in the table are typical for a current of 1 mA (the same values apply to semiconductor diodes). The lower the junction forward voltage the better, as this means that less power is required to "drive" the transistor. The junction forward voltage for a given current decreases with increase in temperature. For a typical silicon junction the change is −2.1 mV/°C. In some circuits special compensating elements (sensistors) must be used to compensate for such changes. The density of mobile carriers in the channel of a MOSFET is a function of the electric field forming the channel and of various other phenomena such as the impurity level in the channel. Some impurities, called dopants, are introduced deliberately in making a MOSFET, to control the MOSFET electrical behavior. it is less suitable for fabricating integrated circuits. Because the electron mobility is higher than the hole mobility for all semiconductor materials, a given bipolar n–p–n transistor tends to be swifter than an equivalent p–n–p transistor. GaAs has the highest electron mobility of the three semiconductors. It is for this reason that GaAs is used in high-frequency applications. A relatively recent[when?] FET development, the high-electron-mobility transistor (HEMT), has a heterostructure (junction between different semiconductor materials) of aluminium gallium arsenide (AlGaAs)-gallium arsenide (GaAs) which has twice the electron mobility of a GaAs-metal barrier junction. Because of their high speed and low noise, HEMTs are used in satellite receivers working at frequencies around 12 GHz. HEMTs based on gallium nitride and aluminium gallium nitride (AlGaN/GaN HEMTs) provide a still higher electron mobility and are being developed for various applications. Max. junction temperature values represent a cross section taken from various manufacturers' data sheets. This temperature should not be exceeded or the transistor may be damaged. Al–Si junction refers to the high-speed (aluminum–silicon) metal–semiconductor barrier diode, commonly known as a Schottky diode. This is included in the table because some silicon power IGFETs have a parasitic reverse Schottky diode formed between the source and drain as part of the fabrication process. This diode can be a nuisance, but sometimes it is used in the circuit. Discrete transistors can be individually packaged transistors or unpackaged transistor chips (dice). Transistors come in many different semiconductor packages (see image). The two main categories are through-hole (or leaded), and surface-mount, also known as surface-mount device (SMD). The ball grid array (BGA) is the latest surface-mount package (currently only for large integrated circuits). It has solder "balls" on the underside in place of leads. Because they are smaller and have shorter interconnections, SMDs have better high-frequency characteristics but lower power rating. Transistor packages are made of glass, metal, ceramic, or plastic. The package often dictates the power rating and frequency characteristics. Power transistors have larger packages that can be clamped to heat sinks for enhanced cooling. Additionally, most power transistors have the collector or drain physically connected to the metal enclosure. At the other extreme, some surface-mount microwave transistors are as small as grains of sand. Often a given transistor type is available in several packages. Transistor packages are mainly standardized, but the assignment of a transistor's functions to the terminals is not: other transistor types can assign other functions to the package's terminals. Even for the same transistor type the terminal assignment can vary (normally indicated by a suffix letter to the part number, q.e. BC212L and BC212K). Nowadays most transistors come in a wide range of SMT packages, in comparison the list of available through-hole packages is relatively small, here is a short list of the most common through-hole transistors packages in alphabetical order: ATV, E-line, MRT, HRT, SC-43, SC-72, TO-3, TO-18, TO-39, TO-92, TO-126, TO220, TO247, TO251, TO262, ZTX851. Unpackaged transistor chips (die) may be assembled into hybrid devices. The IBM SLT module of the 1960s is one example of such a hybrid circuit module using glass passivated transistor (and diode) die. Other packaging techniques for discrete transistors as chips include Direct Chip Attach (DCA) and Chip On Board (COB). Researchers have made several kinds of flexible transistors, including organic field-effect transistors. Flexible transistors are useful in some kinds of flexible displays and other flexible electronics. 2N3904/2N3906, BC182/BC212 and BC546/BC556: Ubiquitous, BJT, general-purpose, low-power, complementary pairs. They have plastic cases and cost roughly ten cents U.S. in small quantities, making them popular with hobbyists. AF107: Germanium, 0.5 watt, 250 MHz p–n–p BJT. BFP183: Low-power, 8 GHz microwave n–p–n BJT. LM394: "supermatch pair", with two n–p–n BJTs on a single substrate. 2N2219A/2N2905A: BJT, general purpose, medium power, complementary pair. With metal cases they are rated at about one watt. 2N3055/MJ2955: For years, the n–p–n 2N3055 has been the "standard" power transistor. Its complement, the p–n–p MJ2955 arrived later. These 1 MHz, 15 A, 60 V, 115 W BJTs are used in audio-power amplifiers, power supplies, and control. 2SC3281/2SA1302: Made by Toshiba, these BJTs have low-distortion characteristics and are used in high-power audio amplifiers. They have been widely counterfeited . BU508: n–p–n, 1500 V power BJT. Designed for television horizontal deflection, its high voltage capability also makes it suitable for use in ignition systems. MJ11012/MJ11015: 30 A, 120 V, 200 W, high power Darlington complementary pair BJTs. Used in audio amplifiers, control, and power switching. 2N5457/2N5460: JFET (depletion mode), general purpose, low power, complementary pair. BSP296/BSP171: IGFET (enhancement mode), medium power, near complementary pair. Used for logic level conversion and driving power transistors in amplifiers. IRF3710/IRF5210: IGFET (enhancement mode), 40 A, 100 V, 200 W, near complementary pair. For high-power amplifiers and power switches, especially in automobiles. ^ "1926 – Field Effect Semiconductor Device Concepts Patented". Computer History Museum. Archived from the original on March 22, 2016. Retrieved March 25, 2016. ^ "Milestones:Invention of the First Transistor at Bell Telephone Laboratories, Inc., 1947". IEEE Global History Network. IEEE. Archived from the original on November 21, 2014. Retrieved December 7, 2014. ^ "The Nobel Prize in Physics 1956". Nobelprize.org. Nobel Media AB. Archived from the original on December 16, 2014. Retrieved December 7, 2014. ^ Moavenzadeh, Fred (1990). Concise Encyclopedia of Building and Construction Materials. ISBN 9780262132480. ^ Lilienfeld, Julius Edgar (1927). Specification of electric current control mechanism patent application. ^ Vardalas, John (May 2003) Twists and Turns in the Development of the Transistor Archived January 8, 2015, at the Wayback Machine IEEE-USA Today's Engineer. ^ Lilienfeld, Julius Edgar, "Method and apparatus for controlling electric current" U.S. Patent 1,745,175 January 28, 1930 (filed in Canada 1925-10-22, in US October 8, 1926). ^ "Method And Apparatus For Controlling Electric Currents". United States Patent and Trademark Office. ^ "Amplifier For Electric Currents". United States Patent and Trademark Office. ^ "Device For Controlling Electric Current". United States Patent and Trademark Office. ^ a b "Twists and Turns in the Development of the Transistor". Institute of Electrical and Electronics Engineers, Inc. Archived from the original on January 8, 2015. ^ Heil, Oskar, "Improvements in or relating to electrical amplifiers and other control arrangements and devices", Patent No. GB439457, European Patent Office, filed in Great Britain 1934-03-02, published December 6, 1935 (originally filed in Germany March 2, 1934). ^ "November 17 – December 23, 1947: Invention of the First Transistor". American Physical Society. Archived from the original on January 20, 2013. ^ Millman, S., ed. (1983). A History of Engineering and Science in the Bell System, Physical Science (1925–1980). AT&T Bell Laboratories. p. 102. ^ Bodanis, David (2005). Electric Universe. Crown Publishers, New York. ISBN 978-0-7394-5670-5. ^ "transistor". American Heritage Dictionary (3rd ed.). Boston: Houghton Mifflin. 1992. ^ "The Nobel Prize in Physics 1956". nobelprize.org. Archived from the original on March 12, 2007. ^ a b Guarnieri, M. (2017). "Seventy Years of Getting Transistorized". IEEE Industrial Electronics Magazine. 11 (4): 33–37. doi:10.1109/MIE.2017.2757775. ^ "1948, The European Transistor Invention". Computer History Museum. Archived from the original on September 29, 2012. ^ Bradley, W.E. (December 1953). "The Surface-Barrier Transistor: Part I-Principles of the Surface-Barrier Transistor". Proceedings of the IRE. 41 (12): 1702–1706. doi:10.1109/JRPROC.1953.274351. ^ Wall Street Journal, December 4, 1953, page 4, Article "Philco Claims Its Transistor Outperforms Others Now In Use"
^ Electronics magazine, January 1954, Article "Electroplated Transistors Announced"
^ "Der deutsche Erfinder des Transistors – Nachrichten Welt Print – DIE WELT". Welt.de. November 23, 2011. Archived from the original on May 15, 2016. Retrieved May 1, 2016. ^ Hirsh, Rick. "Philco's All-Transistor Mopar Car Radio". Allpar.com. Retrieved February 18, 2015. ^ "FCA North America - Historical Timeline 1950-1959". www.fcanorthamerica.com. ^ Riordan, Michael (May 2004). "The Lost History of the Transistor". IEEE Spectrum: 48–49. Archived from the original on May 31, 2015. ^ Chelikowski, J. (2004) "Introduction: Silicon in all its Forms", p. 1 in Silicon: evolution and future of a technology. P. Siffert and E. F. Krimmel (eds.). Springer, ISBN 3-540-40546-1. ^ McFarland, Grant (2006) Microprocessor design: a practical guide from design planning to manufacturing. McGraw-Hill Professional. p. 10. ISBN 0-07-145951-0. ^ Heywang, W. and Zaininger, K. H. (2004) "Silicon: The Semiconductor Material", p. 36 in Silicon: evolution and future of a technology. P. Siffert and E. F. Krimmel (eds.). Springer, 2004 ISBN 3-540-40546-1. ^ Price, Robert W. (2004). Roadmap to Entrepreneurial Success. AMACOM Div American Mgmt Assn. p. 42. ISBN 978-0-8144-7190-6. ^ "Milestones:Invention of the First Transistor at Bell Telephone Laboratories, Inc., 1947". IEEE Global History Network. IEEE. Archived from the original on October 8, 2011. Retrieved August 3, 2011. ^ "ATI and Nvidia face off Archived May 23, 2013, at the Wayback Machine." CNET (October 7, 2009). Retrieved on February 2, 2011. ^ Kaplan, Daniel (2003). Hands-On Electronics. pp. 47–54, 60–61. Bibcode:2003hoe..book.....K. doi:10.2277/0521815363. ISBN 978-0-511-07668-8. ^ van der Veen, M. (2005). "Universal system and output transformer for valve amplifiers" (PDF). 118th AES Convention, Barcelona, Spain. Archived (PDF) from the original on December 29, 2009. ^ a b Streetman, Ben (1992). Solid State Electronic Devices. Englewood Cliffs, NJ: Prentice-Hall. pp. 301–305. ISBN 978-0-13-822023-5. ^ Horowitz, Paul; Winfield Hill (1989). The Art of Electronics (2nd ed.). Cambridge University Press. p. 115. ISBN 978-0-521-37095-0. ^ Sansen, W. M. C. (2006). Analog design essentials. New York, Berlin: Springer. p. §0152, p. 28. ISBN 978-0-387-25746-4. ^ "IGBT Module 5SNA 2400E170100" (PDF). Archived (PDF) from the original on April 26, 2012. Retrieved June 30, 2012. ^ Buonomo, S.; Ronsisvalle, C.; Scollo, R.; STMicroelectronics; Musumeci, S.; Pagano, R.; Raciti, A.; University of Catania Italy (October 16, 2003). IEEE (ed.). A new monolithic emitter-switching bipolar transistor (ESBT) in high-voltage converter applications. 38th IAS annual Meeting on Conference Record of the Industry Applications Conference. Vol. 3 of 3. Salt Lake City. pp. 1810–1817. Retrieved February 17, 2019. ^ Zhong Yuan Chang, Willy M. C. Sansen, Low-Noise Wide-Band Amplifiers in Bipolar and CMOS Technologies, page 31, Springer, 1991 ISBN 0792390962. ^ "Single Electron Transistors". Snow.stanford.edu. Archived from the original on April 26, 2012. Retrieved June 30, 2012. ^ Sanders, Robert (June 28, 2005). "Nanofluidic transistor, the basis of future chemical processors". Berkeley.edu. Archived from the original on July 2, 2012. Retrieved June 30, 2012. ^ "The return of the vacuum tube?". Gizmag.com. May 28, 2012. Archived from the original on April 14, 2016. Retrieved May 1, 2016. ^ "Transistor Data". Clivetec.0catch.com. Archived from the original on April 26, 2016. Retrieved May 1, 2016. ^ "Datasheet for BC549, with A, B and C gain groupings" (PDF). Fairchild Semiconductor. Archived (PDF) from the original on April 7, 2012. Retrieved June 30, 2012. ^ "Datasheet for BUK854-800A (800volt IGBT)" (PDF). Archived (PDF) from the original on April 15, 2012. Retrieved June 30, 2012. ^ "Richard Freeman's HP Part numbers Crossreference". Hpmuseum.org. Archived from the original on June 5, 2012. Retrieved June 30, 2012. ^ "Transistor–Diode Cross Reference – H.P. Part Numbers to JEDEC (pdf)" (PDF). Archived (PDF) from the original on May 8, 2016. Retrieved May 1, 2016. ^ "CV Device Cross-reference by Andy Lake". Qsl.net. Archived from the original on January 21, 2012. Retrieved June 30, 2012. ^ Sedra, A.S. & Smith, K.C. (2004). Microelectronic circuits (Fifth ed.). New York: Oxford University Press. p. 397 and Figure 5.17. ISBN 978-0-19-514251-8. ^ Rojas, Jhonathan P.; Torres Sevilla, Galo A.; Hussain, Muhammad M. (2013). "Can We Build a Truly High Performance Computer Which is Flexible and Transparent?". Scientific Reports. 3: 2609. Bibcode:2013NatSR...3E2609R. doi:10.1038/srep02609. PMC 3767948. PMID 24018904. ^ Zhang, Kan; Seo, Jung-Hun; Zhou, Weidong; Ma, Zhenqiang (2012). "Fast flexible electronics using transferrable silicon nanomembranes". Journal of Physics D: Applied Physics. 45 (14): 143001. Bibcode:2012JPhD...45n3001Z. doi:10.1088/0022-3727/45/14/143001. ^ Sun, Dong-Ming; Timmermans, Marina Y.; Tian, Ying; Nasibulin, Albert G.; Kauppinen, Esko I.; Kishimoto, Shigeru; Mizutani, Takashi; Ohno, Yutaka (2011). "Flexible high-performance carbon nanotube integrated circuits". Nature Nanotechnology. 6 (3): 156–61. Bibcode:2011NatNa...6..156S. doi:10.1038/NNANO.2011.1. PMID 21297625. Amos SW & James MR (1999). Principles of Transistor Circuits. Butterworth-Heinemann. ISBN 978-0-7506-4427-3. Bacon, W. Stevenson (1968). "The Transistor's 20th Anniversary: How Germanium And A Bit of Wire Changed The World". Bonnier Corp.: Popular Science, Retrieved from Google Books 2009-03-22. 192 (6): 80–84. ISSN 0161-7370. Warnes, Lionel (1998). Analogue and Digital Electronics. Macmillan Press Ltd. ISBN 978-0-333-65820-8. "Herbert F. Mataré, An Inventor of the Transistor has his moment". The New York Times. February 24, 2003. Archived from the original on June 23, 2009. Michael Riordan (2005). "How Europe Missed the Transistor". IEEE Spectrum. 42 (11): 52–57. doi:10.1109/MSPEC.2005.1526906. Archived from the original on February 14, 2008. C. D. Renmore (1980). Silicon Chips and You. ISBN 978-0-8253-0022-6. Wiley-IEEE Press. Complete Guide to Semiconductor Devices, 2nd Edition. Wikimedia Commons has media related to Transistors and Transistors (SMD). IEEE Global History Network, The Transistor and Portable Electronics. All about the history of transistors and integrated circuits. Charts showing many characteristics and links to most datasheets for 2N, 2SA, 2SB. 2SC, 2SD, 2SH-K, and other numbers.